Goldtone Gemstone and Pearl Sword Pin Set with pearls, agate, citrine and lapis stones. Measures 2 3/4" x 1 1/4". Goldtone Pave Rhinestone Sword with Crescent Moon Fraternal pin set with pave crystal chaton rhinestones and featuring an inverted crescent moon. Measures 2 1/4" x 3/4" and marked "1950 BILLE.CO." Scottish Sterling Sword Brooch Measuring 4 1/2" x 1 1/8" and marked "SCOTLAND" with a series of four illegible hallmarks. Older "C" style closure and hinged pin mechanism. Mexican Sterling Sword Pin Measuring 3 1/4" x 1/2" and marked "MEXICO MF". Gold-plated Sword with Fish Pin Set with a single black glass stone in a fish's mouth. Measures 1 3/4" x 1". Coro Coat-of-Arms Pin Red, white and blue enameled coat of arms includes lion, castle and fleur-de-lis motifs and is surrounded by wings, an orb and a scepter, and topped by a crown. A sword crossed with a battle axe complete the design. Measuring 1 3/4" x 1 5/8" and marked "Coro" in script without a copyright symbol on the back of the piece and on the pin mechanism. Goldtone Sword with Enameled Crescents and Bear Head Featuring two crescents with gold and purple enamel dotted with stars and a bear's head on the blade, and a bird's head at the hilt. Measuring 2 3/8" x 5/8". Glass Encased Carriage Motif Sword Goldtone sword features a glass-encased carriage. Measuring 2 1/2" x 3/4" and marked "PAT. 2383012" dating the piece circa 1944. Sterling Shamrock Sword Etched sterling sword with a single shamrock riveted between the hilt and blade. Measures 3" x 7/8" and marked "STERLING". Vogue Bijoux Goldtone Pave Sword Pave-set with crystal rhinestone chaton bands and measuring 2 3/4" x 1/2". Marked "VOGUE BIJOUX". Goldtone Sword with Perched Eagle Brooch Stamped design with right-facing perched eagle on a sword with decorate chain swag. Measuring 3 1/4" x 3" (includes the chain). Coro Gigantic Sword Brooch With an eagle and Great Seal of the United State on the goldtone hilt and a silvertone blade, this sword brooch measures an amazing 5" x 1". Marked "Coro" in script on the pin mechanism and "Coro" in script with the Pegasus logo on the back of the sword blade. Blumenthal Crossed Swords Pin Silvertone with crossed swords or daggers and measuring 1 7/8" x 1". 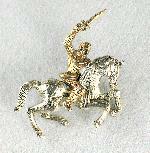 Marked "B. Blumenthal & Co., Inc."
ART Knight with Sword on Horseback Pin Featuring a silvertone horse carrying a goldtone, sword-wielding knight in armor. Measuring 1 1/4" x 1 1/2" with stick-pin and marked "ART". Coro Rhinestone Sword Brooch Rose-gold vermeil sterling sword is studded with graduated sizes of rhinestones in shades of red, blue, green, purple and orange and offset with crystal rhinestone chatons. Measuring 3 1/4" x 1 1/4" and marked "STERLING BY Coro" in a cartouche. Goldtone Sapphire Rhinestone Sword Brooch Set with sapphire-blue and crystal rhinestones and featuring a chain swag. Measuring 3 1/2" x 1 1/4". Goldtone Red and Crystal Rhinestone Sword Brooch Highlighted by siam-red chaton rhinestones and set with rows of crystal chatons at the hilt and along the top edge of the blade. Measures 3 3/8" x 1". 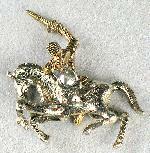 Coro Fantasy Sword Goldtone sword features a winged dragon atop the blade of a sword and a snake's head for the hilt. Set with a single faux pearl and diamond-shaped rhinestones in shades of sapphire, emerald and ruby. Brooch measures 2 7/8" x 1 3/8" and marked "Coro" in script without a copyright symbol. Goldtone Sword with Phoenix Pin Topped by an armored head, set with garnet-red rhinestones and featuring a crowned phoenix rising on the blade, this pin measures 2 1/4" x 5/8". Korda Thief of Bagdad Sword Brooch Goldtone and set with siam, amethyst, sapphire, and emerald pear and navette rhinestones and faux goldtone pearls. Pale blue enamel provides highlights. Measuring 4 1/2" x 1 1/4" and marked "Thief of Bagdad" and "Korda", this design was produced by the Rice-Weiner Co. in the early 1940s to promote director Alexander Korda's movie.